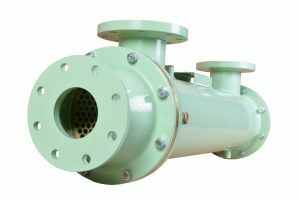 The successful concept of the box cooler is also reflected in our wide range of shell and tube heat exchangers for water-water and/or oil cooling. Within this you have a choice of various diameters and a selection of materials, lengths and internal detail. Moreover, in the case of indifferent or poor water quality, NRF can provide your shell and tube coolers with a protective coating to prevent corrosion, erosion and calcification. Thanks to their unusually compact construction, NRF’s shell and tube coolers are easy to build in to numerous systems such as main engines, generator engines, compressors and winches. Beside the extensive range of standard heat exchangers, NRF can realize a made-to-measure design for you. Even for custom-made, the very shortest delivery times exist.